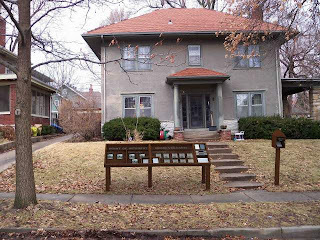 Pete Cowdin, who owns the pictured home, has installed a National Parks style interpretive kiosk in his front yard. Cowdin is an artist who uses the pseudonym A. Bitterman. He is not a fan, I take it, of the kiosks found throughout our National Parks. Using systematic interpretive strategies, Cowdin's "Point of Interest" kiosk contains illustrated historical accounts of the site (going back 300 million years), interpretive discussions of the dwelling, its current inhabitants (Pete’s family) and some of their notable behaviors and adaptive mechanisms. You can get the whole story right here, or by clicking on the image. Flyers are posted regarding changes in weather, fire risk, and rules of engagement with the resident fauna. Informational pamphlets and small artifacts (created by Cowdin's children) are available for the taking. A short hiking trail will also be installed in the front yard and a visitors’ log has been made available. Cowdin's kiosk project is intended to address the way that human relationships with the natural world have been mediated and distorted. As Cowdin says, "we no longer perceive nature as a place we actually inhabit, but rather a place to visit." This insight is completely consistent with my "Two World" views! I'm thinking about a kiosk for my own front yard!